Easily converts from a creeper to seat with a convenient locking pin. Features thick padded cushions for added comfort and six swivel casters for easy maneuverability. 300 lb. weight limit. 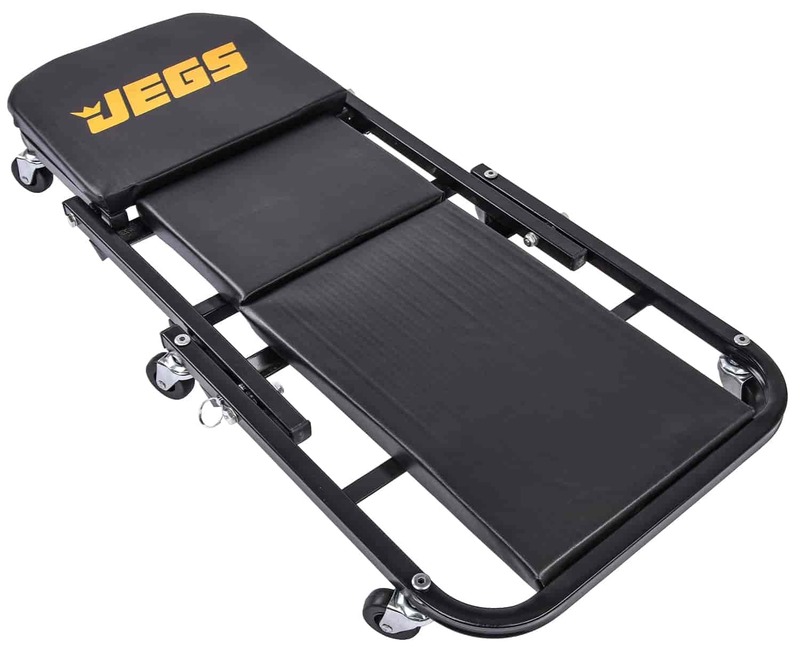 JEGS Creepers & Seats feature heavy-duty construction and comfortable, ergonomic designs. Smooth rolling swivel casters will allow you to glide across home, shop, and garage with ease. Work hard, in comfort, with JEGS creepers and seats. 81165 is rated 4.5 out of 5 by 27. Rated 5 out of 5 by dont want one from Good Value Creeper Easy to assemble, saves hours of back problems and great for rolling under my RV for oil changes. Rated 5 out of 5 by cliff22 from versetile we have outdoor work space, first tech to use it said it rolled good on pavement. Rated 5 out of 5 by Greedy Performance from Perfect Installed without any issues. Bolted right in and very satisfied. Rated 5 out of 5 by Lil Buster from Awsome product Bought this fornjynteenagebson for Christmas, he likes it very much. Rated 5 out of 5 by JPeacock from Great Present Bought this as a gift, and he loves it. Easy assembly, but the wrench they give you is hard to use. Is the headrest adjustable in the flat position? The headrest moves only into the seating position. JEGS 80175 - Garage Guard Mat 24" x 36"